It was the best of keyboards, it was the worst of… wait, no it was the Best of Keyboards, period. A long time ago, someone brilliant at IBM (IBM was full of brilliant people) came up with an idea for a keyboard. This keyboard was constructed of steel and plastic. It was murderously heavy. No, seriously, you could kill someone with it. It had replaceable, cleanable key caps. It used a buckling spring mechanism over a capacitive PCB and was designed in the early 80s to allow people to type all day long on these new “Personal Computers” that IBM was producing. It was called the Model F.
The Model F’s were pretty complex bits of machinery themselves, and as with any bit of complicated engineering, there are always ways to make them better, or less expensive to produce. Thus mid-way through the 80’s, IBM re-designed the Model F slightly and debuted the Model M. The Model M was nearly identical to the Model F, thought it used a membrane rather than a PCB underneath the keys. Additionally, the body of the Model M was made from injection molded plastic, rather than the painted plastic of the Model F that was prone to cracks and failure through abuse. There were other improvements or cost saving measures (depending on how you view it) and that became, arguably, the greatest keyboard ever made for computers. The Model M was introduced around 1985 and built by IBM until the early 90s when IBM sold off parts of it’s manufacturing and design teams with Lexmark picking up the bits of the company that made keyboards. Lexmark continued producing the Modem M into the 90s. I picked one of these up at the IBM junk shop at the RTP campus when I worked there. The Junk Shop (my term) was a wonderland of outdated equipment of all manner. You could pick up oscilloscopes, microscopes, old computers, office furniture, equipment and all manner of things that the company no longer needed. As I perused the aisles of junk, one day, I noticed a curled cord with a PS/2 plug on the end sticking out from a pile of old boxes. Underneath that was a worn IBM Model M keyboard. I paid, if I recall correctly, about $3.00 for this old workhorse. It was born on 13 July 1989 and was model 1391401, the most common variant of the Model M.
I returned to my desk in the SuperLab and after digging up a PS/2 to USB adapter, plugged the old Model M into my Thinkpad and never looked back. I’ve used that keyboard daily for nearly 10 years now whenever I am at my desk, be it at IBM, or now at my home office working for Canonical. I’ve used my Model M on Thinkpads, on desktop machines, servers and evan on a MacBook Air and it worked flawlessly until a week or so ago when, frustratingly, the M, B and Space keys stopped working. Sadly, after 26 years of faithful service, my IBM Model M was ready for retirement. This started the quest for an adequate replacement. I searched High and Low for another Model M, finding them everywhere, but often for a significantly more than what I paid for mine back then at the Junk Shop. Frustration mounted until I stumbled across a company called Unicomp, which, as it turns out, now owns the rights and designs to the IBM Model M that both IBM and Lexmark produced. 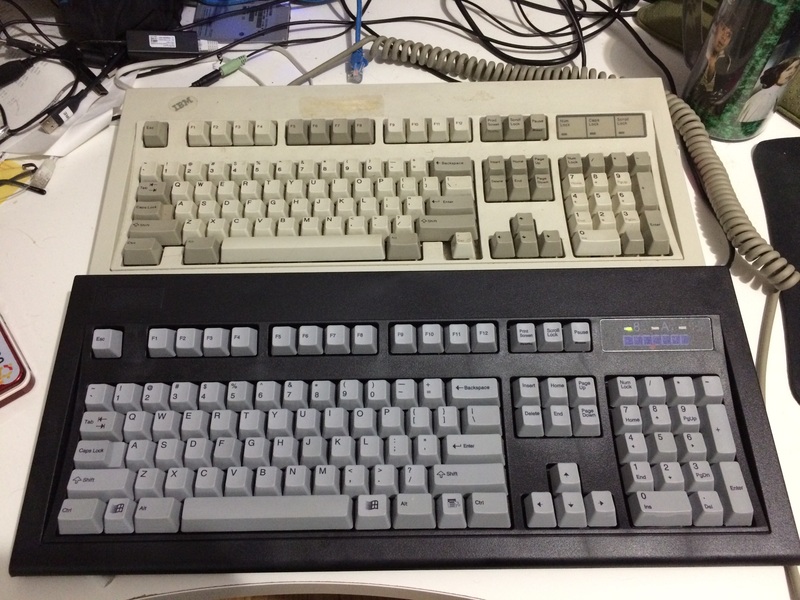 The decision was made and that afternoon, I had ordered and received the shipping notice for a new Unicomp Classic M, based on the same designs as the IBM Model M that I loved. The Unicomp Ms are based on the same designs as the old IBM M’s, as Unicomp owns the designs, having purchased them from IBM. So with that in mind, they should be identical, and they almost nearly are. The issues I’ve encountered are more in build quality than anything else. My IBM Ms were all very heavy, very solid keyboards. The Unicomp models are also weighty, and honestly not that bad in terms of quality. However, the cases have some fitment issues making them just a bit creaky, especially in the corders. But they’re fresh, new, and have that satisfying clicky sound that makes buckling spring keyboards so great. And they keys and mechanisms are solid, and stand up to all manner of abuse. My Unicomp Model M lasted for a year and a half before I broke it. Unfortunately, unlike the IBM Ms which came with drain holes and could stand up to a lot of abuse, the Unicomp M I had seemed a bit weak when it came to spilled coffee. My morning cuppa was it’s downfall ultimately. Half the keys stopped working after that so I was forced to revert to a cheap, wireless backup keyboard until I could source a replacement. Ultimately, I ended up with a Unicomp M of a slightly different design. The new one is just a bit slimmer (it’s not quite as deep as the Classic M) and includes a TrackPoint built into the keyboard. I had hoped that the TrackPoint would be the same as the IBM TrackPoint which were pretty solid pointer devices, once you got used to using them. Unfortunately, the Unicomp parts are less well built, so the TrackPoint feels loose and inaccurate. It’s annoying, and I don’t care to use it for anything needing precision, but it makes it easy to swap between console windows without having to reach over for my trackball, so I won’t complain too much. I’ve now had four Model M keyboards. They are arguably the best keyboards ever made, the design is ancient but still relevant, especially in this age of cruddy chiclet keyboards and non-feedback designs that have no soul. A short while back at IoT World, we introduced a neat little bundle of kit to demonstrate Ubuntu Snappy. This kit consisted of a Raspberry Pi 2 (the updated Pi that Ubuntu can run on), a PiGlow and really sharp Pibow case, both provided by Pimoroni. Needless to say, it was a real hit. An offer came up to get my hands on one of these great, specially made Ubuntu branded versions of the kit and I had to jump on that, because it just looks so darned cool. Happy coincidence, I was already planning on obtaining a Pi 2 to replace my older RPi that I had toyed with off and on over the last couple years. So this first post will be an introduction and first steps. First, the hardware. I won’t go into detail on the Raspberry Pi 2 hardware itself. By now, it’s well known, and it’s well discussed and documented elsewhere to the point where I have nothing Earth shattering to add to that discussion. You can see some basic information at RaspberryPi.org or search the Goog. I will point out the two add-on’s though. First the Pibow case is a plastic case specially made for the Pi 2 and B+ systems. It consists of two clear panels with several layers of custom designed frames in between. They sell different configs that range from skeleton cases to full box. For us, they created one in Ubuntu Orange and laser engraved the Ubuntu logo and Circle of Friends on the top cover. It looks pretty sharp. The PiGlow is another neat addition. It plugs into the pin array on the Pi2 and provides a programmable LED light show. There are ample instructions for making them flash and I’ll get to a brief demo in another post, perhaps. The PiGlow is easily programmable with python, and they provide instructions for installing the necessary libraries to interface with the PiGlow via a Python script. This means it should be quite easy to add a colorful, animated status marker to any python script by adding a few lines of code. 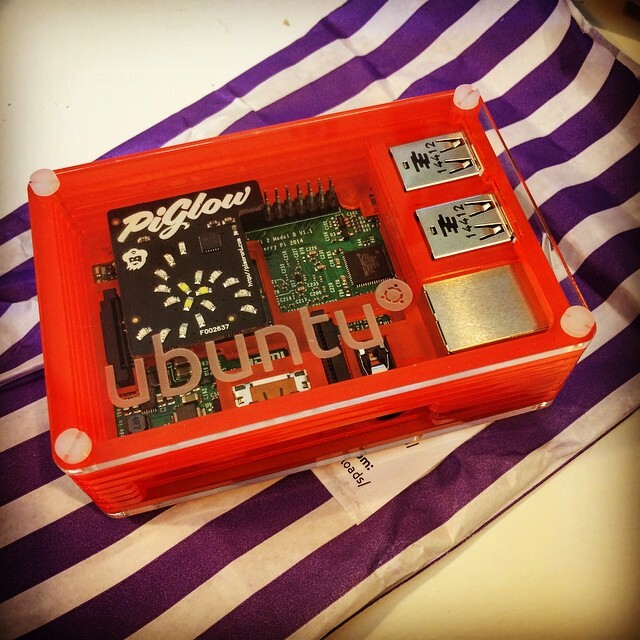 There is video of the PiGlow as well on the Pimoroni site, so enjoy! Now let’s talk about the OS. Because of the upgraded ARM Cortex-V7 chip, the Pi 2 can finally run Ubuntu. Previous incarnations of the RPi used an older ARM v6 chip that Ubuntu was not ported for (though you could get various Debian versions to run on that chip). In April 2015, we launched Ubuntu 15.04 (Vivid Vervet) and with it came Ubuntu Snappy. Snappy is a new transactional version of the OS formerly known as Ubuntu Core, thus, Ubuntu Snappy Core. The key difference is that with Snappy, we no longer use apt to manage package installations. Instead, packages come in Snaps, which are transactional packages that we first developed for the Ubuntu Phone. If you’ve never heard of Transactional packages, that’s ok, because you’ve more than likely used them any time you install or update an application on your smartphone. In a brief nutshell, Transactional Packages are an All-or-Nothing installation that consists of bits of unmodifiable code as well as user-modifiable code. The unmodifiable parts are the core elements of the application, the UI, the libraries, the binary executables, and so forth. The user-modifiable parts are things like custom user configurations, downloaded or added data like documents, photos, icons, and other similar things. When you upgrade an app, you essentially completely replace the unmodifiable bits with the newer version of those bits, unlike traditional package updates that may only update a single library file or binary executable. One of the two biggest benefits to this are that you never have to worry about update creep, where update after update after update could, possibly, cause things to break as they leave behind old, conflicting or unneeded files. The other is that if an update breaks, you can very easily roll back to the last working version. So, for example, if you have Candy Crush version 1.2.3 installed and install 1.2.5 and discover that 1.2.5 is actually broken and you can no longer play Candy Crush, you could simply roll right back to version 1.2.3 and continue on crushing those candies. And neither the update nor the rollback has touched your user-modifiable data (your records, progress and such in this case). So the first thing I wanted to do was get this sucker on my network. My network, however, is very tightly controlled at home. All IP addresses are handed out by DHCP, on an assigned basis, so if your device’s MAC address isn’t specifically listed in dhcp.conf on my server, you won’t get an address. And for wireless devices, even connecting to the access point is MAC controlled, so if your phone, tablet or laptop is not on the ACL on the WiFi access point, you can’t even join the network to ask for an IP address. Sure, it’s not 100% secure, but nothing ever is, and this is “Secure Enough” for my needs and location. Now, for my first idea, I wanted to replace my home DNS/DHCP server with a small IoT type device like a Raspberry Pi. I currently use a hacked together Shuttle PC for this purpose, with a giant external 400W power supply that was made necessary because the small Shuttle PSUs are notoriously flaky, and mine didn’t last three months before it started shutting itself off randomly trying to keep up with the power needs of the CPU on the machine. So that’s a lot of energy being used for a system that essentially does nothing but hand out DHCP requests and answer DNS queries. Transit also serves as a bastion point so I can access my LAN remotely so I will try to set this up to do likewise. To change the file, a couple things had to happen. First, I needed to be the root user. Sudo may have worked, but it’s just as easy to become root to do a lot of things. So sudo -i to become root. On reboot, the root filesystem is again mounted read-only, so if you need to modify more core files, you will need to remount the filesystem once more. allow-hotplug is an interesting thing. It’s intention is to only bring the device up on hotplug events. However, because the ethernet device is always plugged in, on reboot, the kernel detects a hotplug event and brings the device up at boot time, regardless. That means, if you don’t have it plugged in to a switch and turn it on, you could wait a bit while it tries to obtain a dhcp address. I noted that after rebooting the RPi with the ethernet cable removed, the eth0 device was still shown as up with the prescribed IP address. Now that I’m rebooted and have an IP address, lets take a brief whirlwind tour of Snappy before I end this prologue to my Snappy Adventure. So there you have it… there is much more available at https://developer.ubuntu.com/en/snappy/tutorials/ about snappy and its use. The first result is from a D-Link GGS-108 8-Port Gigabit switch that I’ve been using only for the test servers connected to my NUC. The second result is from a TrendNet TEG-S80G 8-port Gigabit switch that handles traffic for the rest of my home. The TrendNet switch connects the NUC, DNS/DHCP, Router, my main workstation and an uplink to a switch in the living room that hosts the TV, Wii, and so forth. Obviously, it’s time to buy a new switch that is NOT made by TrendNet. The ~320Mbps speed is what I’ve been getting for a long while now from that cheap-o switch. I should have used the D-Link for the home lan when I re-cabled. I’ve loved photography since I was very, very young. Going way back to my first camera, an old Kodachrome 110 to a 126 and an old 60’s model Yashica TL-Electro X 35mm. Later on I found myself shooting Polaroid because instamatics were just fun and satisfied a need for instant gratification that wasn’t repeated until today’s digital age where photos can be uploaded or shared at the touch of a button. I’ve dabbled with medium format, pinhole and other 35mm bodies like the Minolta X-700 and Canon AE-1. Of all those, I only held onto the Yashica and the Minolta. Eventually I found myself exploring with digital going back to an early Canon Point-and-Shoot that shot 640×480 maximum and required an ungainly cable and horrific software to even get the picture off. I’ve bought and tossed many small digitals over the years, cameras I’d bought for one reason or another. Oddly, I’ve only owned one digital SLR, a Canon 350D that I’ve loved carrying around the world, taking pictures of my adventures in places like Taipei, Tokyo, London, Oxford, Prague, Switzerland and around the USA. But I must admit I started to grow a bit tired of it all. I found myself more often than not leaving my Canon at home and just shooting things with an iPhone. The iPhone is not a good camera. Well, it’s not bad, but it’s not great. What is IS, however, is convenient. It’s small, light weight, has a reasonably decent sensor that even if it’s not the best out there, is workable. What it lacks though, is physical zoom, low-light ability and anything remotely satisfying as a photographer who likes landscapes and architectural shots and panoramics and such. It IS good for street photography, as evidenced by the literally millions of photos of every day life uploaded to the word on a daily basis. But because of it’s limitations, I found myself again looking for something better. Something more professional. More capable. But not big and bulky. I wanted a compact camera with the benefits of an SLR without the weight, yet still capable of using those big, heavy lenses if I wanted. I really, truly, would love to have a full frame SLR one day, but the size of the things is off-putting as I don’t make a living taking pictures and the cost is astronomical in many cases. 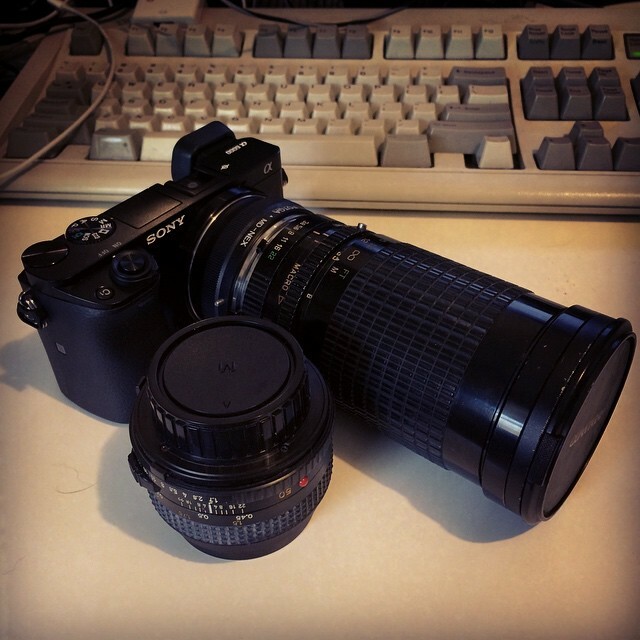 So that set me down the path of looking at Micro 4/3’s and APS-C mirrorless cameras. They’re small, light but use interchangeable lenses allowing room to grow as well as the ability to shoot in any situation. They are basically baby SLRs, only no flappy mirror, no giant body, no big battery grip (unless you want one). They still accept hotshoe attachments (mostly flashes, video light panels and microphones) and can be used for everything from portraiture and street photography to landscapes and sports or action. After a lot of research, reading and agonizing over details, I settled on the current Sony Alpha 6000, right now the almost top of the line mirrorless from Sony. The next level up is the A7 II, a full frame (!!) mirrorless less than the size of any full frame dSLR and just as capable. The a6000 is an amazing little camera. It’s capable of HD video at 60 fps with amazing tracking AF and lenses with power zoom for smooth transitions from close in to wide. But I don’t shoot a lot of video at all, and on the rare occasion I do, it’s with a GoPro. My interest is in the fact that it’s as capable as any prosumer SLR but half the weight and bulk. The 16-50mm kit lens is underrated in my opinion. Of course it’s not perfect, it IS, after all, an inexpensive kit lens, but just search around a site like Flickr for photos taken with the lens and you’d be amazed at what it’s actually capable of. If that’s still not good enough, there are some very well reviewed Zeiss lenses out there that will set you back more than $1K and some in-betweeners as well like the Sony 18-105mm f3.5-5.6. There are also some very nice primes that get as fast as f2.8 or perhaps f2. It has a good 24MP APS-C sensor, 129 AF points, great color and contrast, and a basket full of other features. One thing the Sony E-Mount cameras don’t have, yet, is a very large lens selection. That’s slowly changing, but there still aren’t as many as you’d find from Canon or Fuji or other companies out there. That’s where the adapter comes in. I could have done this with my dSLR, and to be honest it never really clicked in my mind how much fun it could be, but for 14.00 I picked up a rather well built adapter that allows me to attach my old Minolta MD mount lenses to the 6000’s E-Mount frame. And for the first time, I have actually been giddy, even if I was just taking pictures of junk around my house. The old 50mm f/1.7 is simply astounding on this camera. My somewhat cheap Quantaray 35-200mm Macro was surprisingly good, perhaps better than I remember it being. These are things I will still need to practice a lot with, to get back into the habit of using a purely manual focus lens without any of the benefits of modern lenses, but it’s an adventure I’m looking forward to. It’s small enough, even if I carry the heavier older Minolta glass that I can carry it around the globe and not feel like I’m lugging a suitcase just for camera gear and electronics. It’s a far better performer than my 350D and so far I’ve quite enjoyed shooting with it. I still have my old Canon 350D, but to be honest, the more I shoot with this little Sony, the less and less I feel the desire for a 5D or 1D or larger body. [UPDATE] MPow Bluetooth 4.0 Stereo Headset – Far better than it has any right to be. 2: I will be able to hear music, even if it is tinny, or too low, or scratchy, or poppy, or generally low-fidelity. I will preface this with the fact that I have not, nor do I plan to, use the phone features of this headset for making calls. I bought this specifically to replace a broken pair of Plantronics BackBeat Go II bluetooth buds for working out in the gym, jogging, or whatever. So this review only focuses o that use case. As the title said, I was quite surprised by these. After using the medium sized hook inserts and putting the smaller ear tips on, they fit far more comfortably than I expected them to. In fact, I could conceivably wear these for hours without issue, they are as comfortable as my Bose QC-20i and Shure SE215s. They also do an admirable job of blocking noise (non-actively). I don’t hear a lot of rubbing noises as I move, they fit and sit firmly in my ears. The sound reproduction was amazing. At least, amazing in the sense of “HOLY CRAP I DIDN’T EXPECT THAT”. The sound reproduction actually is quite good. They aren’t as good as my Shures or Bose, or other high end headsets, but you really don’t expect that from something at this price point. What you do get, however, is good, clear audio reproduction. My only real complaint there is that the sound is a bit bassy but not distorted. Just bassy with a bit of loss on the upper range. Mid-range is satisfying. They battery life seems to be good. I really don’t know yet how long the battery will last, I’ve only used them on two gym trips so far, about and hour and 15 minutes each trip, so far on the same charge. This is already worlds above the Plantronics set that I paid twice as much for, which only have battery life for about 2 hours max. So there are the big pros for this set of bluetooth earbuds. 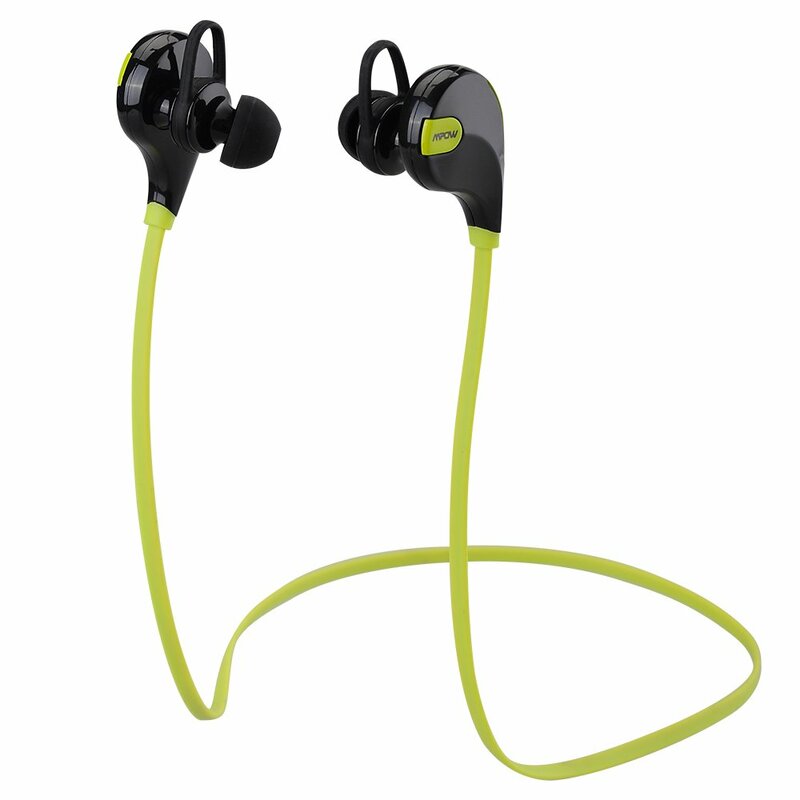 They are comfortable, have reasonable, and actually surprisingly good audio quality, and so far exemplary battery life. The only con I’ve come across so far is that the controls don’t seem to control everything on my iPhone. So I can use the + and – buttons with a click and hold to skip songs, but when I use them to adjust volume, they adjust the headset volume NOT the overall phone volume. This isn’t as big a deal as it seems, though I imagine that lack of control may be an issue using them to make phone calls with. There you have it. For the price, these are far better than they have any right to be. They’re already better than the more expensive set from the very respected Plantronics line at half the cost. These have definitely turned out to be a great purchase. … the Plantronics replacements are going on Craigslist. I am really surprised by these things. They sound good. They’re comfortable for my use, an hour or two at a time at the gym. And the battery seem to go on forever. I’m at two weeks of use now (at about 1 hour 30 minutes a pop) and they STILL are on the original charge. Even when new, the Plantronics needed to be recharged after every two workouts. So far, I’m 7 workouts in and still haven’t had these quit on me. I’m not going to recharge them either until they do finally die on me. I want to see just how long they’ll go. So all in all, this is still one of the most surprising purchases I’ve made in a while. I really didn’t have high expectations when I bought these headphones, but they are doing everything I expected of the Plantronics set in the first place, and they’re doing those things better.